We’ve written extensively about online marketing budgets, but as we’ve worked with more and more credit unions, we’ve come to realize that many of the standard marketing budget calculations for traditional B2B and B2C companies do not apply. Each year, credit union marketers are pressured to improve results and grow the books. At the same time, consumer behavior is changing, and the traditional marketing channels are not performing the same as they had in the past. All this leaves marketers wondering, how much should be budgeted for marketing? And, which marketing channels are most appropriate for credit union marketing? If you’re in the position to build your marketing budget for 2019 and beyond, and do not know where to start, you'll probably start first by analyzing last year’s budget. Based on last year’s performance, you try to assess what performed well, and cut the areas that may have under-performed. Should your 2019 marketing budget be higher than 2018? If so, by how much? Data published in the CMO Survey in February 2018 suggested annual marketing budgets would increase in the next 12 months by 8.1% for the banking and finance sector. Considering the current economy and general health of financial institutions, this is probably a reasonable, if slightly ambitious, estimate. Evaluating what other credit unions are doing can be helpful, though there is considerable variance from one organization to another when considering the size, location, competition, charter and other factors. The chart below summarizes data previously analyzed by thefinancialbrand.com. 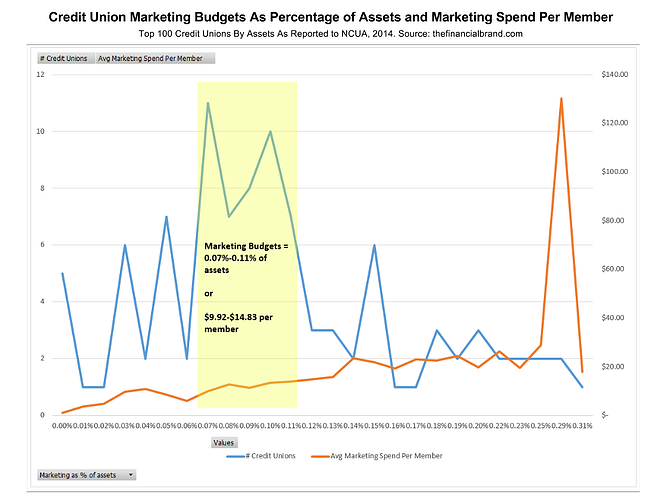 When looking at the marketing budget of the top 100 credit unions by assets and comparing their marketing spend as a percentage of assets, you can see the highest concentration of credit unions come in with marketing budgets that represent between 0.07% and 0.11% of assets (the highlighted area of the chart below), with the average credit union spending .10% of assets on marketing. When expressed as an amount spent per member, the average marketing budgets hover around $9.92-$14.83 per member. The median amount spent per member is $13.00. This amount can vary widely, with some outliers spending a whopping $203 per member to as little as $.05 per member, but somewhere in the average range is where most credit unions will want to aim for. Of course the amount spent per member is a much different figure than the amount invested per net NEW member. The average investment for that is much higher, at an average of $281. Not surprisingly, there is a strong correlation between the amount of marketing dollars invested per member, and membership growth. How much do credit unions spend per year on social media, content marketing, digital advertising and other channels? Download our digital marketing calculator for a recommended budget by channel. Like other industries, credit unions are shifting dollars from traditional marketing channels to online channels, but exactly how much is unclear. Based on the information we’ve gathered from marketers we’ve talked to, it would seem that many credit unions have been slower to invest in online marketing channels than our clients in other industries. In 2018, as we’ve reported previously, the average firm will allocate 42% of its marketing budget to online, and that rate will increase to 45% by 2020. While credit unions are expected to fall short of that on average, we are seeing progressive credit unions with strong goals for growth spending closer to that amount. In an example, a credit union with $300 million in assets could have an annual marketing budget of $210k-$360k with $88k-151k spent directly on online marketing in 2018. Every credit union we’ve spoken to recently has mentioned attracting younger members (aka, millennials) as a key objective. Don’t overlook Generation X, who is currently considering their options for financing their children’s college, and caring for their aging parents while trying to figure out how to save for retirement. To connect with Gen X and the elusive millennials, being selective with the online channels is smart, but the marketing message needs to resonate as well. If you want to attract both audiences, plan on investing more in creative development and more for campaign management targeting the audiences separately across more digital channels simultaneously. According to a Forrester Research report from April 2018, US marketers will increase their investment in marketing technology by 27% over the next four years. Forrester projected that marketing technology will account for 30% of total marketing spending in 2018, and an August 2018 report by Gartner aligned with that, with marketing leaders reporting that they expected to spend 29% of their marketing budget on marketing technology in 2018, up from 22% in 2017. Within marketing tech, the areas of highest investment growth, according to Forrester, are data, ad technology and marketing automation. This is a question we get all the time, and as you might expect, the answer depends. First, let’s source some data provided by other marketers. 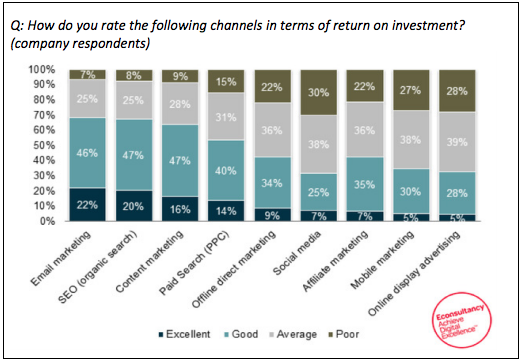 When marketers were asked how they rate each of the channels in terms of return on investment, email, SEO, content marketing and paid search came out on top. The survey data above was from 2014, but if this same survey was conducted today, the responses would likely be similar, however the categorization of digital marketing channels requires modification. As content marketing and SEO have evolved greatly over the past 3-4 years, the lines between them have become even more gray. To many marketers, content marketing is SEO, and social media is content marketing. Social media, while not rated well in the chart above, has evolved from a mediocre source of leads using organic posting, to one of the more successful channels for engaging new leads as well as existing members, using the precise targeting capabilities of paid social advertising. Visit our article to read more about how much credit unions should spend on social media marketing. As online advertising platforms have become more sophisticated, and targeting has gotten better, categorizing all online advertising that is not paid search as online display is misleading. In our experience, we’ve had great results with email marketing for cross-selling and retention. Paid search is great at account acquisition. And the various forms of online display can be powerful for branding, acquisition or cross-selling depending on the exact channel, campaign objectives and targeting. SEO is no longer a tactic for consideration – It’s required! Make sure your website ranks well for obvious non-branded, local searches (like, Richmond, VA credit unions). If it doesn’t, fix it. Make sure each of your branch locations shows up on local search results, including Google Maps, and that the listed information, like branch hours, is accurate. Plan on investing about 3-5 hours per branch location to get the core local SEO items done right. The best approach to budgeting would be to first consider all of the business objectives, and to have the right system of measurement in place to accurately determine your acquisition costs. For example, let’s say your credit union has a goal to originate $4 million in new home loans this year. If you can confidently forecast that mortgage applications can be obtained at $200 each through paid marketing channels and your average mortgage is $200,000 and applications close into funded loans at a rate of 10% (then each funded loan actually costs you about $2000 each to acquire). It would take 20 loans of $200,000 to reach your $4 million goal. So you could expect marketing costs of $40,000 to achieve that objective (20 new loans at a cost of $2000 each). These types of calculations require knowledge of and access to both internal data (like average loan size, and loan funding rates) as well as complete and accurate digital marketing data. If you don’t know how to track digital marketing performance, you’re at a heavy disadvantage when it comes time to develop budgets and secure C-suite and board approval. 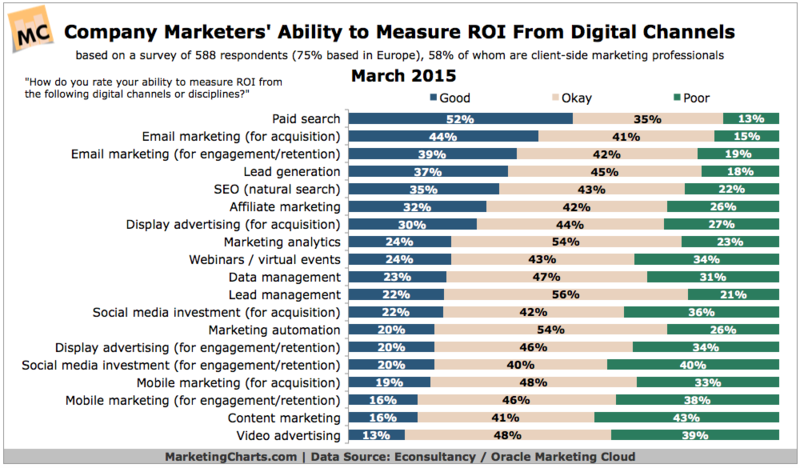 Marketers have regularly expressed concern over their ability to measure return from online marketing channels. The chart below clearly conveys this. While 52% of marketers feel good about the ability to track paid search, 20% or fewer feel good about tracking the return from social media, display advertising, or video advertising. If you don’t have a good handle on your website and online campaign tracking, commit to investing in 2019 in setting up the proper systems of measurement and good quality dashboard reporting. Identify your target market and invest in developing buyer personas so your marketing can connect with their unique pain points and motivations. Diversify your marketing tactics in 2019 to reach your target audience(s) in new places and to find new acquisition channels. Many organizations will spend more than 44% of their marketing budget online in 2019. Will yours? 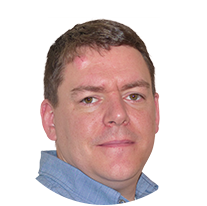 Phil Woods is the Director of Digital Marketing where he is responsible for creating, executing, and managing online marketing strategies. 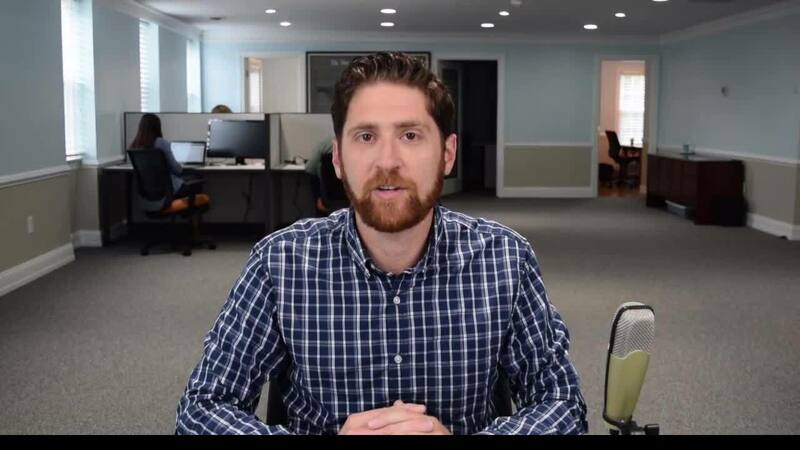 Phil’s extensive digital marketing experience spans across small business, financial services, and media industries.